Snazzy Sponsor Signs for your Tournament! We print full color golf sponsor signs that give your tournament a professional look. 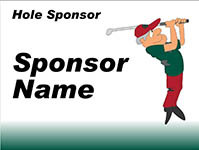 We can put your logo on them, or use our golfer (we used both on the golf sponsor sign pictured below). Best of all, we can ship them in two days if you are in a hurry. We can also print larger golf sponsor signs for beverage carts, vinyl banners, and foamcore mounted signs to put on an easel. 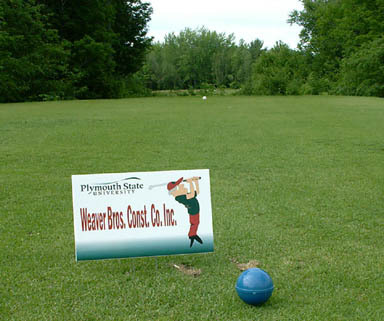 Our golf sponsor signs are printed directly on coroplast (plastic cardboard) and can be used year after year. They are completely waterproof and will not fade in the sun. All signs come with a wire stake taped to the back. Jab them into the ground and you are ready to go! They are easy to use, and fast to install and remove. Download a template, design your signs in PowerPoint. 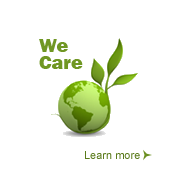 All you need to do is type in the names of your sponsors and send the file back to us. 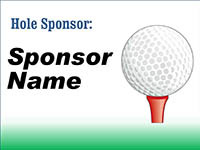 We'll print your golf sponsor signs and have them on the way the next business day. Put the names of your sponsors into the template. You can also put your logo in. When complete, call us to order.